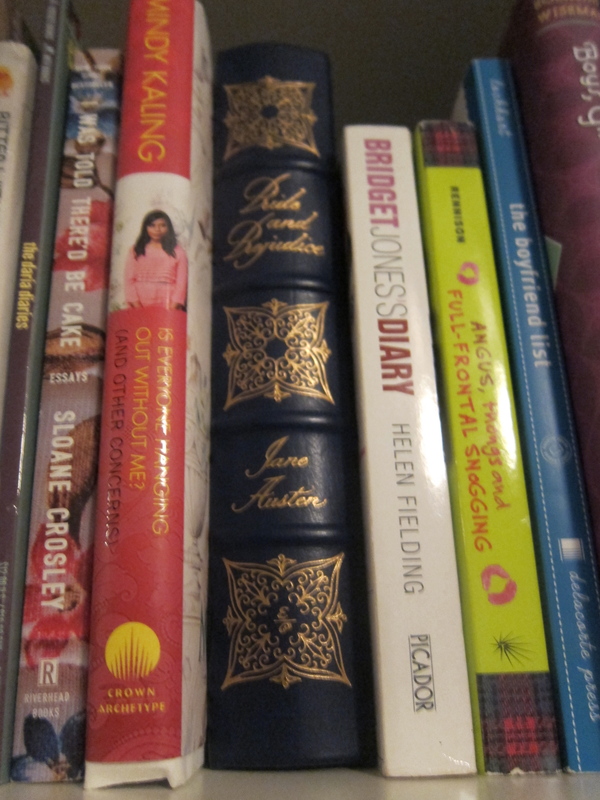 Here’s more of the imagined conversations between the books on my new bookshelves. See Part 1 here. 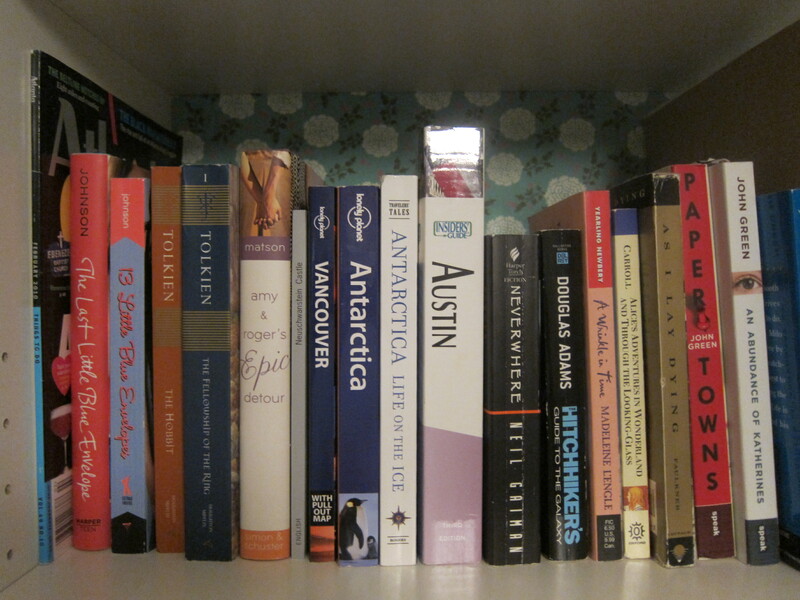 The road trip books are crowding the top shelf and trying to ignore my scrapbook from study abroad at Oxford. They’re like, “Look, unless this journey of yours is a metaphor for finding yourself, we’re not interested.” The Murry kids from A Wrinkle in Time are sitting next to Hitchhiker’s Guide to the Galaxy, and I’m sure they’re comparing notes to see if they met any of the same people. Richard Mayhew from Neverwhere is eavesdropping and trying to get up the nerve to jump in. I put both of John Green’s road trip books next to As I Lay Dying because I figure those smartie pants kids will feel smug about sitting next to William Faulkner. Also, Alaska and Margo can get together and form the “John Green Dream Girls” club. I’ve helpfully supplied Amy and Roger with a handful of guidebooks, though Antarctica would be a long drive for them. Finally, the Tolkien hobbitses are feeling bewildered on their perch next to manic Maureen Johnson and her 13 Little Blue Envelopes series. She’s loving it, of course, and she’s asking many inappropriate questions about Sauron. Elsewhere, Mindy Kaling is dropping bon mots to an impressed Bridget Jones and a slightly confused Elizabeth Bennet. Bridge is proposing cocktails, Mindy is proposing cocktails and crazy manicures, Elizabeth is finding modern English much too familiar, and Georgia Nicolson is scheming to swipe some booze and trying to pick up tips from Ms Jones. Mindy tries out her best fake British accent, and the other three dissolve in laughs. Ruby Oliver from The Boy List is craning her head around the others to exchange wry looks with Sloane Crosley and Daria. 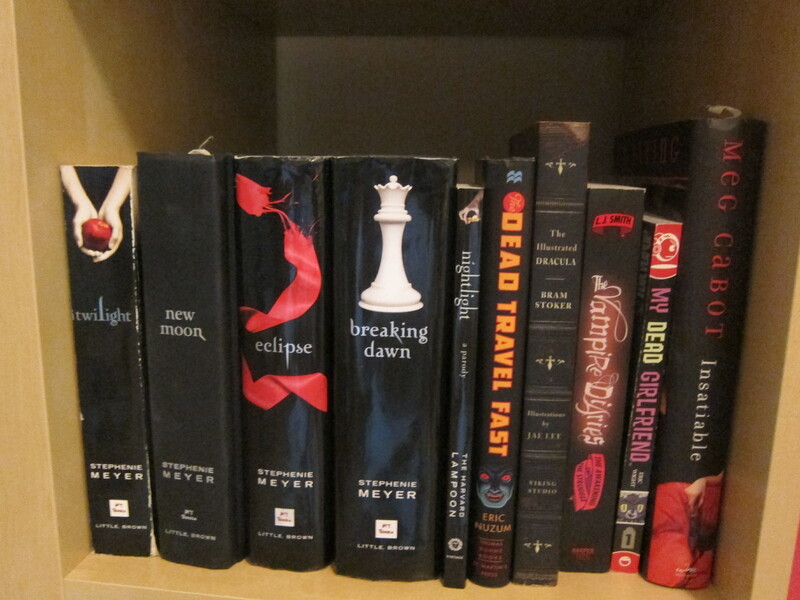 Ah, the dreaded Vampires and The Women Who Love Them shelf. Bella takes up a lot of room here (of course she does), but there’s room for a kind of support group moderated by the author Dead Travel Fast. He’s like, “You guys know these are creatures who actually want to kill you, right?” And Elena of The Vampire Diaries is like, “Yeah, but have you seen them? Super good looking.” Bella high fives her and makes some comments about sparkling. At this point, Vlad Dracula turns his head and clears his throat meaningful while pointing to his gross and sparkle-free face and Meena Harper from Insatiable makes a gagging sound. Finney of My Dead Girlfriend scratches his head and says, “So, none of you are dating ghosts? Why am I here again?” And that’s when I sheepishly admit that he just fit into the space really nicely. Next time: A date night for some YA couples and the children of the Gods have brunch. Posted on June 15, 2012, in Books and tagged 13 little blue envelopes, a wrinkle in time, adult fiction, amy and roger's epid detour, as i lay dying, bookcase, bram stoker, bridget jones, daria, dead travel fast, dracula, e lockhart, elizabeth bennet, eric nuzum, eric wight, georgia nicolson, helen fielding, hitchhiker's guide to the galaxy, hobbits, I was told there'd be cake, insatiable, is everyone hanging out without me, jane austen, john green, LJ Smith, looking for alaska, madeline l'engle, maureen johnson, meg cabot, mindy kaling, morgan matson, my dead girlfriend, neil gaiman, neverwhere, non fiction, obsessive organization, paper towns, pride and prejudice, ruby oliver, sloane crosley, stephenie meyer, the boy list, the vampire diaries, tolkien, twilight, vampires, william faulkner, YA fiction. Bookmark the permalink. 2 Comments. Looks to me like pretty soon you are going to need another bookcase. Like visiting the seven continents, I might have to make it a life goal to visit one book from each of your shelves. That’s a pretty neat idea, Dad. I’d blog about it if you did it.